Greenwich Cannons Baseball was formed in 2004 in order to offer a highly competitive baseball experience for youth baseball players in Greenwich. Since then, the organization has grown to four teams with more than 60 players participating. Provide Greenwich's most dedicated baseball players the opportunity to compete together at a high level, and against the most skilled teams in the tri-state area. Offer the best instruction and individual player development at each age group. Assist players navigating the college recruitment process. Click here to view the list of Cannons alumni appearing on college baseball rosters across the USA from Division 1 to Division 3. 13U - Team comprised mainly of 6th-7th graders who played Little League or Cal Ripken baseball in 2018. This team includes a spring season consisting of training and tournament play. Summer season includes league play, plus 1-3 outside tournaments. Prep Cannons: 13-15 year old players born between January 1, 2003- April 30, 2005. Team comprised of 7th-9th graders. This team includes a spring season consisting of training and tournament play. Summer season includes Legion league play, plus 1-3 outside tournaments. The 2017 Cannons Prep team won the Connecticut American Legion Baseball state championship. Junior Cannons: 14-17 year old players born in 2001-2004. Team comprised of high school age players. Season includes American Legion Zone 4 league play and playoffs, plus 2-3 outside tournaments. Senior Cannons: 16-19 year old players born in 1999-2002. Team comprised of high school age players, plus college freshman born in 1999. Season includes American Legion Zone 4 league play and playoffs. 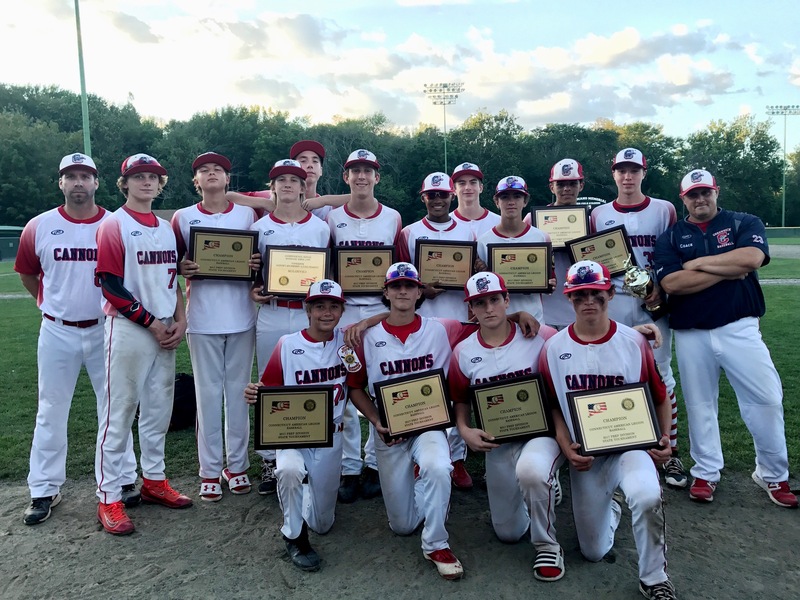 The 2017 Cannons Senior team won the Connecticut American Legion Baseball Zone 4 championship before falling in the quarterfinals of the state tournament. All teams compete under the team name “Greenwich Cannons”. It is the goal of Greenwich American Legion Baseball to provide a unique baseball experience for players seeking the highest levels of competition in our area. As a Greenwich program, our objective is to attract players from ages 13 to 19 living in Greenwich who are committed to playing baseball and who aspire to compete at the high school level and beyond. We have successfully assembled a first rate group of professional coaches for all teams with exceptional baseball backgrounds both as players and as coaches. Upon completion of the high school baseball seasons, the Junior and Senior Cannons teams start practice at the beginning of June. League games begin in early June. The Senior Cannons typically play 5-6 games a week, for a 27-game American Legion schedule. The Connecticut state Legion tournament begins in mid-July and runs through mid-August for teams reaching the state finals. The Junior team plays 4-5 games a week. The Junior season also includes 2-3 weekend tournaments, and potentially a weekend team training experience. In addition, Coaches Tarantino and Carbino run practice sessions in advance of games to work on specific situational skills and strategies. The defending CT State Champion Prep team will play 40-45 games between April and August. The spring schedule includes 3-4 weekend tournaments across the tri-state area. Summer season includes American Legion league play and playoffs, plus 2-3 weekend tournmanets. All teams will practice at least once per week while in season. The Senior Cannons play a dedicated American Legion schedule and must qualify for the state playoffs which begin in mid-July. Teams that win the state tournament are eligible to play in the Regional tournament which occurs the second week of August. The Junior and Prep teams also play a dedicated American Legion schedule and state playoffs. For Juniors and Prep, the Cannons also include tournament play to enhance the competitive experience. Given the high level of play and competitive nature of the Cannons program, the expectation of player commitment is significant. While we appreciate and understand that conflicts arise and are inevitable, coaches expect players to commit to their teams from early-June through the end of July/early August. Roster sizes are determined to maximize playing time and provide appropriate depth by position. Player absences from practices and games negatively impacts the ability of our teams to remain competitive throughout the season. Players should be prepared to be on the field as many as six days per week. American Legion Baseball was formed nationwide in 1926 and is well-established as the pre-eminent youth baseball program in the country. Ten million players have participated in American Legion Baseball throughout the years; and it is estimated that 75% of all collegiate baseball players competed in American Legion Baseball. Connecticut’s program was created in 1928 and just completed its 85th year of operation. Eight alumni of Connecticut American Legion Baseball have played in the Major Leagues. For more information on American Legion Baseball, please refer to the organization’s website at www.ctalbb.com. In Greenwich, we have established a relationship with the local American Legion Post 29 which sponsors and sanctions our participation in American Legion Baseball. We are grateful for the support of Post 29 and are honored to help perpetuate the relationship between the country’s Veterans and youth baseball. In a relatively short timeframe, Greenwich American Legion Baseball has created an attractive franchise among the baseball community in Greenwich. The program operates as a not-for-profit organization and is governed by a board of directors which manages both the current and long-term interests of Greenwich American Legion Baseball, including securing financial stability, continuing to attract the best players and coaches available and insuring sufficient practice and playing time on high quality local fields throughout the spring and summer seasons. On the field, our teams have been highly competitive against area competition. During the 2008 season, the Junior Cannons team won both the Connecticut State and New England Regional Championships. This was an extraordinary achievement for our players, coaches and our program. In addition, Mike Abate, the Junior team head coach at the time, was named the American Legion New England Regional Coach of the Year. This success has clearly established the Greenwich Cannons as a prominent baseball program both in the state of Connecticut and throughout the New England region. A precursor of our success in 2008 was the 2006 Junior American Legion team’s runner-up finish in the Connecticut State Championship, a significant achievement for our program in only its third year of play. Scholarship money is available as needed to help defray the cost of participating in Greenwich American Legion Baseball.